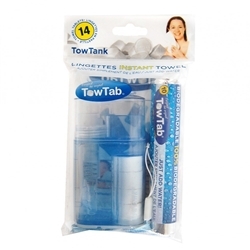 TowTab (Tow pronounced as in Towel) - A small tablet which transforms into an additive-free towlette when mixed with half an ounce of liquid. Made of all-natural, biodegradable rayon fiber. Ideal for personal hygiene and cleaning chores. Sprinkling a few drops of water (or any liquid other than acetone) on a ¾-inch diameter TowTab and watching it unfurl - as if by magic - into an all-natural, 10-inch-by-12-inch towelette ideal for all cleaning chores. To apply a cool towel to your body, simply unfold after moistening and grab two adjacent corners, then wave gently in the air. The towel will become cooler! The TowTank carries water and 4 TowTabs in a convenient holder! No need to look for water. Instantly moisten your TowTabs! This package includes 1 TowTanks with 14 TowTabs.